Free Shipping Included! 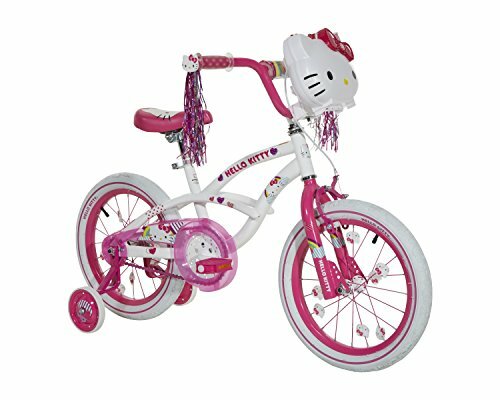 Hello Kitty Girls Bike with Light Up Case, White/pink, 16'' by Hello Kitty at Joes V Cycle. MPN: 8053-36TJ. Hurry! Limited time offer. Offer valid only while supplies last. Your little Hello Kitty enthusiast will love the sweet handlebar case and Coordinating streamers on the dynacraft Hello Kitty girls' 16 inch bike. Your little Hello Kitty enthusiast will love the sweet handlebar case and Coordinating streamers on the dynacraft Hello Kitty girls' 16 inch bike. The quick-release seat and training wheels can be adjusted to fit your little one's needs. A durable steel frame helps ensure long-lasting use, and caliper brakes help your child stay in control while riding. Ages 4 to 8 years.